Tonight Sarah and the rest of the Nelsonville-York Marching Buckeyes joined other high school marching bands on the field at Peden Stadium with the Ohio University Marching 110. 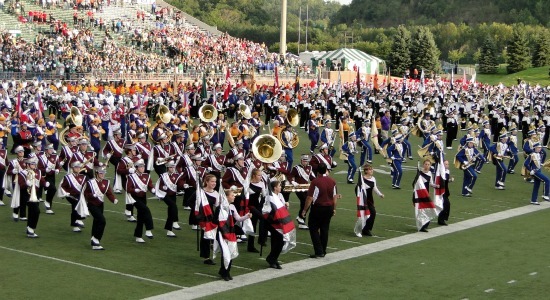 The bands played together for the pregame and halftime shows. During the pregame performance the bands played The Star-Spangled Banner. And for the halftime show the band joined together for Tonight Tonight. The O.U. Bobcats defeated Gardner-Webb by a score of 30-3. This was the 100th career win for Frank Solich as a head coach. Click here for all of my pictures from Band Day at O.U.